When we discussed Spenser Rapone, remember that I said this. But to the collectivists, there are still tried and true, staid institutions such as the military, and even football. The Marxists have managed literally to transform the culture of the college campus, a battle that was begun some 50 years ago and won well before the attention turned directly (rather than opaquely) towards white, middle class, Christian America. The battles aren’t just beginning for them. This is the end game for them, unless America turns to weapons to settle the war decisively. 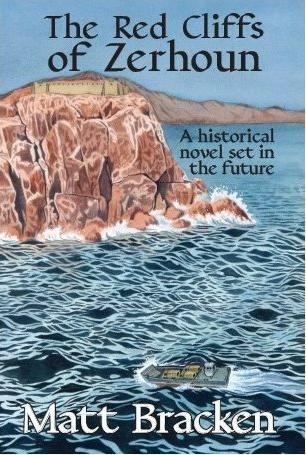 The end game involves the terraforming of the institutions in which America has [foolishly] placed its trust. So it doesn’t surprise me at all to read this. The “long march” comment refers to a strategy of institutional infiltration and subversion coined by student activist Rudi Dutschke but originally developed by Antonio Gramsci, a Marxist thinker whose thought developed in the wake of the failure of economic determinism to bring about a revolution. Think deeply about what you’ve seen happen over your lifetime and what you’re seeing now and this will all make perfect sense – if you’re even half awake and sentient. The couple had moved to their house on Arroyo and Bohmen avenues less than a month before. The former tenants included a known gang member, Timothy Tafoya. Four days before, Tafoya had shot and killed 32-year-old Ricky Muniz as he confronted Tafoya and another man as they spray painted gang-affiliated graffiti behind his house. Pueblo police identified Tafoya as a person of interest and obtained several search warrants, including one to look for evidence of graffiti material, devices that hold photos and messages, gang paraphernalia and jewelry — but not a weapon — at the house that Tafoya hadn’t lived in for about two months after his family had been evicted, according to the lawsuit. Police watching the house said they had seen Tafoya, who was wearing an ankle monitor, outside the residence, according to the lawsuit. But they did not see him enter or leave the house. Officers and SWAT were given a description and photos of Tafoya. Then, they surrounded the house. But instead of a 21-year-old man walking out the front door, they were met face to face with a 60-year-old man with a bad back. Officers shouted for Duran to put up his hands, which he did. He exited with his hands up and was told to back up toward the SWAT officers, which he did until he backed into the barrel of a firearm at the back of his head, according to the lawsuit. 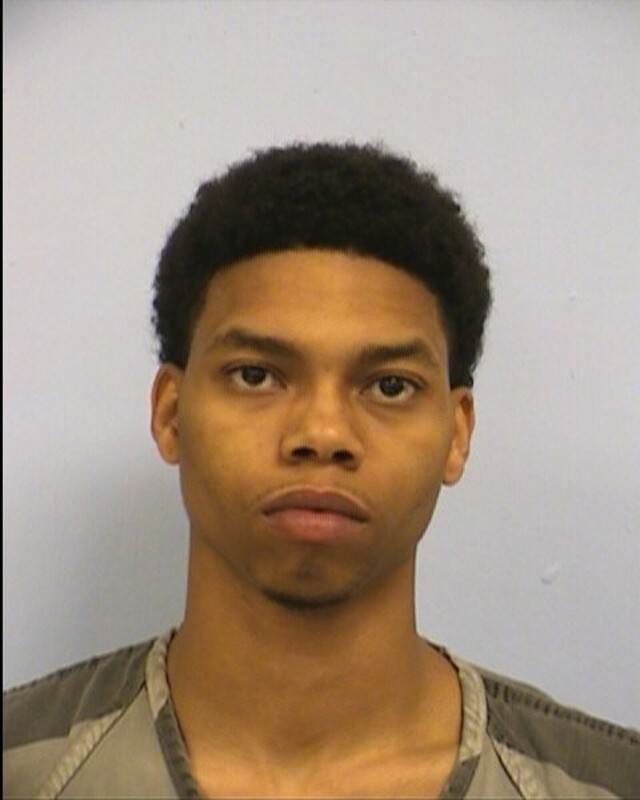 He was then handcuffed and given to Officer Jackie Torres. She forced him to bend over and walked him to a police SUV, putting him in the back. Duran has previously had surgery on his back and said he was screaming, “My back! My back! I’m disabled,” according to the lawsuit. Deborah Duran was also handcuffed and detained. About 10 minutes later, Det. Glen Fillmore uncuffed William Duran, taking him out of the car, and saying, “Obviously, you are not the people we are looking for,” according to the lawsuit. Good Lord. The guy they were after was wearing an ankle monitor. How much easier can this get? Do they have such things as detectives in this part of the world? But hey. Most 60 year old and 18 year old men look the same to me too. The good news is that even though the cops violated the most basic rules of gun safety and reduced margin in the defense in depth to killing someone by pointing the muzzle of their weapons, at least they got to go home safely at the end of their shift. As far as I’m concerned, nothing is more important than that. Not constitutional rights, not the fourth amendment, nothing. I know you all feel the same way. Leyland — a member of the Naval Academy’s 2017 heavyweight crew team — entered a woman’s house during the night by breaking in through a side patio door, police said. When he was confronted by the woman, police said he refused to leave and locked her out of the home when she walked outside. Police surveyed the home with guns drawn and found Leyland in the master bedroom, Miguez said. At some point while officers were in the home, Moore fired his gun, but the bullet did not hit anyone. Miguez said in August that Leyland was shirtless and unarmed during the alleged burglary. Police said Leyland jumped out of a window, sustaining minor injuries, and resisted arrest after officers caught up with him outside. “It’s easier for someone lying in wait to initiate an action than for us to react to what’s in front of us,” she said. Moore incorrectly had his finger on the trigger while surveying the home, Miguez said, and not removed from the trigger to prevent such misfires. Moore, with no history of such incidents, will go through retraining to reinforce proper gun safety, she said. Gosh, I hate it when that happens to me. I remember the last time I pulled my gun on someone at the grocery store and put my finger on the trigger. I almost shot somebody, but thankfully, the cops came along and wanted to coach me on the rules of gun safety. All is well now. They left feeling like I had learned my lesson. No charges, no harm, no foul. Except for the glass I shot out and the people I almost killed. Thank goodness all I had to do was get a little schooling from the good guys. 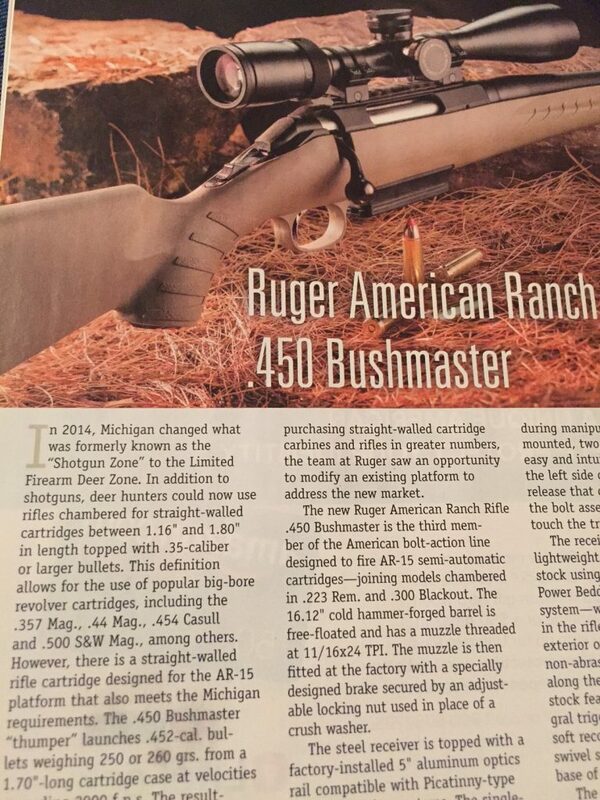 I see this issue of American Rifleman has an article on the Ruger American Ranch Rifle in .450 Bushmaster. I also see that American Rifleman already tested it. I confess to intense interest in this rifle. I had not studied the .450 Bushmaster before, but to get such a big thumper and wallop in such a small package as this rifle is appealing to say the least. And it’s an aesthetically pleasing gun too. Do any readers have experience with the .450 Bushmaster for hog hunting, or just range shooting or carry as a bush gun? Let me first start by saying that the clearing procedure I followed would have been correct for almost every firearm you encounter on a regular basis, and due to following the four basic rules of range safety, no one was injured. In fact, I was the only person to even notice the discharge. I was still at fault, I should’ve handled it differently, but I was with a large group of people on a deadline, and went into autopilot. My range has a collection of post dealer sample machine guns. From Kriss Vectors to FALs to AKs to Uzis. This particular incident was with a mini-uzi with a suppressor. For those of you who aren’t aware, the full size and mini uzis fire from an open bolt. The round fires as soon as the bolt chambers a round, as opposed to more common closed bolt systems where the firing pin is actuated separately from the bolt. So, in the process of a machine gun shoot with tourists, one experienced a failure to feed. A round partially made it out of the magazine but not to the bolt. The next round had tilted and blocked the bolt from moving forward. Usual procedure is to remove the mag, rack the action and remove the round. However, in an open bolt system, you are supposed to rack the bolt back first. This is where I messed up. Upon me removing the magazine, the bolt slammed home with the hung round and fired. The weapon was pointed downrange, as always. No other safety rules were violated aside from my mental lapse of the particular operation of the gun. In fact, I was the only one that noticed. Between it being suppressed, and multiple other people shooting, it was lost in the background noise. I did however take it as an opportunity to point out my mistake and teach the customers why the four cardinal rules are important, no matter how experienced you may be. Well, you won’t see me laughing, poking fun, or criticizing him. He knows what he did, he used it as a learning opportunity, and he followed the rules of gun safety. Good for him. But there is this comment. The Swiss Cheese model of accident causation is a model used in risk analysis and risk management, including aviation safety, engineering, healthcare, emergency service organizations, and as the principle behind layered security, as used in computer security and defense in depth. It likens human systems to multiple slices of swiss cheese, stacked side by side, in which the risk of a threat becoming a reality is mitigated by the differing layers and types of defenses which are “layered” behind each other. Therefore, in theory, lapses and weaknesses in one defense do not allow a risk to materialize, since other defenses also exist, to prevent a single point of weakness. The model was originally formally propounded by Dante Orlandella and James T. Reason of the University of Manchester, and has since gained widespread acceptance. He can call it whatever he wants, but in legal parlance (e.g., with various government entities like the NRC) it’s called “defense in depth.” Don’t use the phrase “Swiss cheese model” of safety. Call it what it is – defense in depth. We’ve discussed it many times here on the pages of TCJ. I’ll also take a moment and repeat what we all know and what I’ve said many times. When a LEO points his weapon at someone, he is violating the most important rule of gun safety and using the most important margin in the concept of defense in depth. But it’s okay because he is a LEO, and God knows, they all need to go home safely at the end of their shift. There’s nothing more important than that. It was Austin, and now in Denver. CBS4 has learned that an employee at Denver International Airport has been fired and charged with rifling through passengers’ checked bags on three occasions, and stealing guns out of their luggage. The worker, Melvin Deandre Lewis, 24, worked for Air Serv, a vendor that handles bags and other services for airlines. 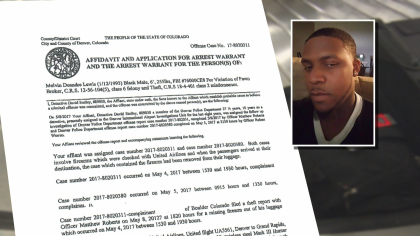 According to court documents and interviews, Denver police believe Lewis opened United Airlines passengers checked bags and stole firearms in April and on two occasions in May. But he looks like such a nice young man, full of promise for the future, just like Ja’Quan Johnson. I guess they’re underprivileged and need more assistance. 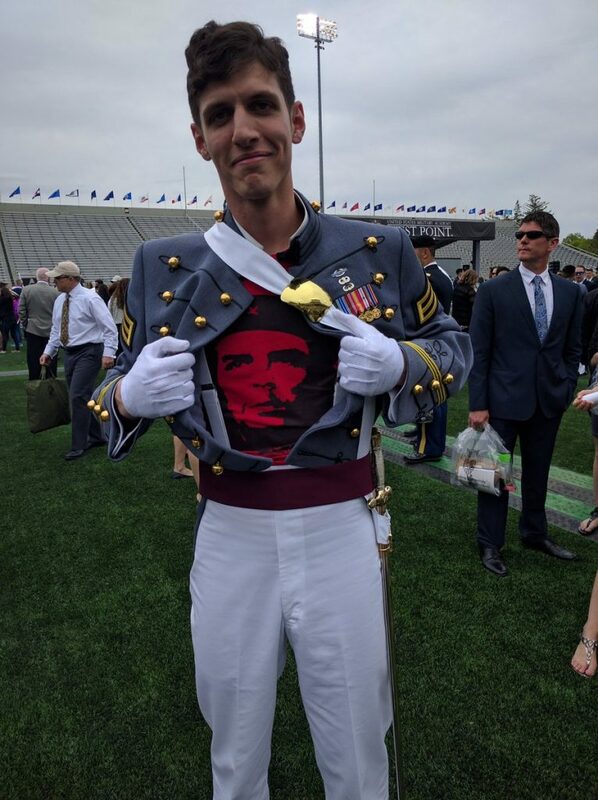 Here is a recent graduate of West Point. His name is Spenser Rapone. 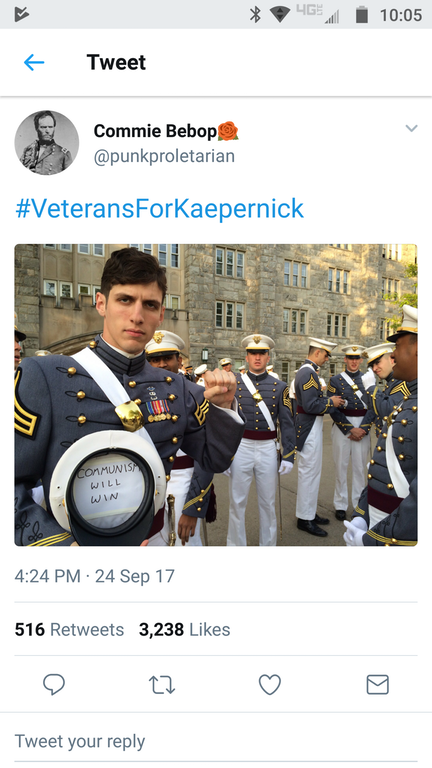 His introduction to fame and glory apparently came from being associated with “Veterans for Kaepernick.” AR15.com has a discussion on him, and West Point has issued a statement of condemnation of his actions. Don’t be surprised. And be aware that the NFL protests, childish and sophomoric that they are, aren’t about the American flag any more than the Antifa protests are about freedom and liberty. Spenser and the NFL are related. On the one hand, there are those who [mistakenly] say that “While I don’t support their views, they have a constitutional right to do what they’re doing.” There are others who assert that no true patriot should risk his life for the benefit of multinational corporations. Both of these views miss the point of all of this. True enough, I begged my youngest son Daniel to get out of the Marine Corps when it came time to reenlist back in 2008 – 2009. I told him he could possibly fight and lose a limb or die for the sake of helping one Islamist army defeat another Islamist army, the entire purpose being to open up rat lines for oil and weapons plays in Northern Africa for American elitists. That warning turned out to be prescient, and I’m glad to say he listened to me. The end game involves the terraforming of the institutions in which America has [foolishly] placed its trust. It’s no mistake that gun controllers and collectivists such as David Petraeus and Stanley McChrystal were flag officers, and even into the ranks of staff officers there were many like Lt. Col. Robert Bateman, who is well known to most of my readers. My son Daniel had some very direct thoughts about Bateman you might want to read again. You can add to that growing list of collectivists young, ideologically leftist officers like Spenser Rapone. Writing as @punkproletarian, He attacks his very alma mater as racist, but if you read into the first several paragraphs, you’ve read enough. This may be managed by a wealthy benefactor such George Soros (who of course has hired many of the Antifa protesters), or it may not be. It doesn’t matter. The rot is so deep that the cancer cannot be excised. As to the NFL protests, if you believe in property rights, contracts and covenants, you must hold to the view that a player doesn’t just have the right to do anything he wants to do, any time he wants to do it, any more than I do as an employee of a corporation. I have no right to disparage my corporation in public, and as an at-will employee, my company has a right to fire me should I violate that trust. The first amendment has no bearing on this subject. This all leads us to the conclusion that the NFL owners must be in agreement with the protests, or at least not in disagreement enough to risk angering their employees. Their employees, the players, want more bling to wear when out clubbing, or something, they know not what, and cannot communicate it to us because most of them are as dumb as a bag of rocks. But we have nothing in common with them, not even a point of contact or agreement to which we can point. If they object to overbearing police presence because of some black boy who didn’t pay taxes, lived off the public dole his whole life, stole whatever he wanted, and decided to walk down the middle of a road he didn’t own before he beat the hell out of someone, or if someone objects that Philado Castile was shot by the cops, we may object that white people have guns pointed at them all the time, have their dogs shot all the time, and get bullied all the time. This has nothing to do with race, notwithstanding whatever the blacks who take the knee want us to think. Here’s the point. What the statists are telling you is that not even the flag, the U.S. military, or something so watched as NFL football constitutes a point of collaboration between you and them. There can be no compromise. They are in this to win, and just like the Chinese who sent men until the machine guns barrels overheated into South Korea, they are willing to sacrifice anyone or anything to get their way. Civil war is coming should America eventually decide to settle this conflict with weapons. If not, it’s essentially over. As a final thought, I haven’t watched a professional sports game for so long I can’t remember. I don’t do professional sports. For those of you who do, find another way to spend your time. Go hiking. Find some intermediate or advanced single track and go mountain biking for the workout of your life. Go to a park and read to your children or grandchildren. Enjoy the shooting sports. But if you sit on a couch all Sunday and watch someone else play games, you’re the same as a crack addict who devotes his life to something that pays no return. In 2005, at the time of Hurricane Katrina, the New Orleans police used the excuse of enforcing compliance with the mandatory evacuation order to confiscate firearms. They went door-to-door seizing guns from the people who stayed behind hoping to ride out the storm. These were the same firearms the citizens expected to have available to protect their lives and property in the aftermath of the disaster. In fact history has repeatedly shown that firearms, including assault weapons, can be very useful and life-saving tools following natural disasters, such as Hurricane Hugo in 1989 and Hurricane Andrew in 1992, and during times of civil unrest, as during the Rodney King L.A. riots of 1992. Gun-grabbing superintendent should have known that confiscation of firearms from persons, who have not committed a crime, is a violation of the Second Amendment — and under the dire circumstances of a natural catastrophe, an inexcusable and unforgivable misjudgment, as well as an affront to the people of New Orleans. Gun confiscation at the time of the Katrina disaster—when they are most needed by citizens to protect their families and property—was such an outrage that several states and the federal government passed laws to prevent that egregious constitutional infringement from ever taking place again during natural disasters. In 2006 Congress passed the Disaster Recovery Personal Protection Act that became incorporated as an amendment to the Department of Homeland Security Appropriations Act of 2007. It was signed into law on October 4, 2006. This federal legislation prevents the government from confiscating legally-owned firearms during times of major disasters or state of emergency. Following the example of the federal government, most state legislatures adopted similar versions of this law. But be that as it may, on Sept 5, 2017, in preparation for contending with Hurricane Irma, the governor of the U.S. Virgin Islands, Kenneth Mapp, contrary to U.S. law, ordered the National Guard to confiscate firearms and ammunition from the people of the islands. Confiscation was supposedly necessary so the authorities “could carry out their mission.” Whatever that may be, we are left to wonder. Nevertheless, the islands are ruled by federal law approved by Congress in 1954, “Revised Organic Act of the Virgin Islands” and subject to U.S laws. Fortunately, the government of the Islands’ plans for gun confiscation seem to have been put on hold after the NRA threatened to file a lawsuit. Washington further wrote: “Time after time during natural disasters, reports of looting and increased armed criminal action have been reported. The primary reason for firearms purchases is to protect self and loved ones, and this is especially important at times when the police are overtaxed and crimes of opportunity are more likely to occur. Natural disasters offer criminals an opening too sweet to resist — and once an individual or group of marauders is at your door, it’s too late to ask the National Guard for your guns back.” Exactly. Well, this may answer my question. According to the writer, gun confiscations never actually occurred in the US Virgin Islands, and I’ll say it again. I suspect that it’s irrelevant anyway. When the gun control laws are so onerous that no one owns a weapon, there is no need for confiscations. In effect, guns have already been confiscated. Take note. If you allow these gun control laws, you are acquiescing to gun confiscations, albeit slowly, like a frog in boiling water. The author does a nice job of outlining why you need firearms in times of emergency. The problem as you know is that you don’t know when an emergency will present itself. A home invasion is just as much of an emergency as a hurricane. A church shooting is just as much of an emergency as an earthquake or any other natural disaster. So you need your firearms all of the time. All of the time. Police say a man charged in a mass shooting at a Tennessee church was armed with two semi-automatic handguns and had two more firearms in his car. Emanuel Kidega Samson is charged with the fatal shooting of one woman and is expected to face several more charges following the rampage at the Burnett Chapel Church of Christ in Nashville that left six others wounded. Police spokesman Don Aaron said Monday that Samson fired 12 rounds from a .40-caliber handgun and had another clip attached to a tactical vest. He was also allegedly carrying a loaded 9 mm in the church and had a .22 caliber pistol and military-style AR-15 in the car he had left running outside the church. But Aaron says police found no AR-15 ammunition on the scene. This church is very blessed that the shooting wasn’t much, much worse than it was. My counsel stands. Keep your head on a swivel, and your hand ready to present. And is it too much to ask that folks be as armed as their possible assailants could be? Is it too much to ask that church security teams all around the country think through this issue, and that they demand that the men of the church be ready to defend themselves, their families and other congregants?